They are smart and fast and the only thing you can count on is that if they can get into it.... they will! Before bringing home a new baby, all parents take the necessary steps to adequately child proof their home. New monkey parents need to do the same thing, but to an even greater degree. A small child doesn't have access to things you place up and out of reach; but for a primate, however small, there is no such place! For this reason, things you may not have considered, can be hazardous. Remember their curiosity knows no limits and they can reach anywhere in the house they want to go. I remember once a while back that I was looking for my little guy and I could hear him chirping happily. I looked up and he was sitting in the dining room chandelier eating a banana chip!! He had to have hopped more than five feet in the air from the table to get up there. Apparently it was no challenge for him! 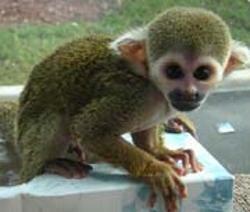 Toilet bowls: A young primate can fall in and drown in less than a minute. Even when they are older, although they can get themselves out, it isn't exactly a safe place to play. Many of them like to play in water and even icky potty water is just water to them. Toilet water with bowl cleaner added is lethal. Make it a family habit to KEEP THE LID DOWN without fail. Tobacco products: I mention tobacco products in the healthy quick-list but I've included it here as well because if you have tobacco products in your home you need to be religious about keeping them locked safely away and out of reach of your monkey. Pretend that pack of cigarettes is a loaded gun if you must, but know this: A monkey ingesting the tobacco from just one cigarette will very likely be fatal. Nicotine is a highly toxic substance. Also be aware that if you smoke in your home and you have a monkey, second-hand smoke will have a severe and permanent impact on his health and well-being. Rocking Chairs and Recliners: Never, ever collapse a recliner or rock in a chair without knowing the exact whereabouts of your monkey. The tragic stories I've heard about babies hurt in recliners are heartbreaking. They are small and fast and if you don't know where they are, stop what you are doing until you do. There is no way my guy could be under the chair at this point, but I'm so accustomed to looking that I still do it... and that's a good habit to get into. Also get in the habit of checking the tops of doors before closing them. Tiny fingers caught in a door would be a tragic thing. Keep Medications in Child Proof Containers: People without young kids at home are prime candidates for monkey parenthood, but also aren't used to worrying about everyday medications that may be on a bathroom counter or left in a handbag. Monkeys can get into just about anything. You can't just have a bubble pack of medications laying around or put your pills on the counter while you get a glass of water. Keep medications completely out of reach without exception. All it would take is one unsupervised second for them to grab a pill and swallow it. The more they get the message that the pill is off limits the more likely they are to try and grab it. To them it's a game. Use only child proof containers, and even then, keep them out of sight. As for handbags...even a small monkey can open one without much of a challenge. It's not the place to keep your gum and mints anymore, either. House plants: I was going to list the plants that are known toxic to our pet monkeys and when I realized how extensive the list was, I pretty much came to the conclusion that if safety was a priority I would just forget the house plant thing altogether. There are so many plants that are either mildly toxic or downright lethal that to list them and then worry if you properly identified the plant can't be worth the hassle. Aside from toxicity, you will quickly learn that anything sitting on a tabletop will either be played with, uprooted, chewed to pieces or dismantled in only seconds. In the scheme of things, if you feel you simply must have house plants, I'd go ahead with that and forget about having a monkey. Electronics: Yes monkeys like to chew...on just about everything, particularly when they are teething. Keep your electrical wiring covered up and out of sight. And another reminder... Keep an eye on your baby at all times. A monkey left alone in the room is like leaving a curious two-year old unsupervised. Household cleaners: Again, keep it locked away and safe. I have everything from dish washing liquid to laundry soap to fabric softener in a cabinet with a door too heavy for my guy to open. The way you need to safeguard your baby from household hazards is dependent on how large or strong he may be. Make sure what you do is appropriate for his size and breed and remember it's better to overdo than do too little. Kitchen Safety: Knives, can openers, pizza slicers, cheese graters, bladed food processors, hot stoves, kitchen cleansers, SOS pads, Automatic Dishwasher tablets, breakable glass, deep fryers, electric toasters...you get the picture. Before you leave anything out in the open, or before you consider keeping it in a non monkey-proof place, stop and think: Can this harm my baby in any way? If you're using it, keep an eye on it, and when your finished put it away. If they can get at it, they will. They are fast and determined. Never take a chance. Swimming Pools and Hot Tubs: These may be obvious, but for new monkey parents that aren't' used to having small kids around it may not seem like it's a problem. Any situation that may be hazardous to a young child, is even more so for a monkey. They are at times absolutely fearless, and love to play in water. Be aware that a fence around a pool may keep out a child, but won't even slow down a monkey. Wash Your Hands: Anytime you handle household cleaners or medication, be sure to wash your hands. Residue can linger and monkeys often lick and kiss hands. Also, if you have been out and about around people, it's smart to come home and change your clothing and carefully wash your hands. Viruses like colds and flu, and particularly herpes associated with a common cold sore can be lethal to a young primate. Never handle your baby, particularly a young one without properly sanitizing your hands. If it sounds excessive....trust me, it isn't. I never take chances where the health of my baby is concerned.